Medieval Morsels: Badges and banners - Richard III's boar, Henry Tudor's dragon, antelopes and the Tudor rose! Badges and banners - Richard III's boar, Henry Tudor's dragon, antelopes and the Tudor rose! When Lancastrian Henry Tudor seized the crown of England at the Battle of Bosworth on 22nd August 1485, almost 530 years ago to the day, he defeated Yorkist King Richard III, who was killed on the battlefield. Henry was close to ending the 32 year old political and military conflict between the Houses of Lancaster and York that came, later, to be known as the “Wars of the Roses”. The final cessation of hostilities between cousins actually came two years later with the Lancastrian victory at the Battle of Stoke Field in 1487. Richard III seasoned military strategist at age 32 and confident of victory, rode out from the medieval town of Leicester behind his personal badge, a white - or “argent” in heraldic terms - boar. Richard III's motto in Latin reads "Loyalty binds me"
But before 48 hours had elapsed the town worthies and populace were to turn out once more, this time to pay homage to their new monarch Henry VII. He had fought and won under his personal badge - the dragon - of his native Wales. Henry's father was Edmund Tudor from the House of Richmond, and his mother was Margaret Beaufort from the House of Lancaster. In January 1486, now King Henry VII, he married Elizabeth of York to bring all factions together. And with her he went on to have a second son Henry who was, following the death of his older brother Arthur, to become Henry VIII. The historian Thomas Penn writes:“The "Lancastrian" red rose was an emblem that barely existed before Henry VII. Lancastrian kings used the rose sporadically, but when they did it was often gold rather than red; Henry VI, the king who presided over the country's descent into civil war, preferred his badge of the antelope. Contemporaries certainly did not refer to the traumatic civil conflict of the 15th century as the "Wars of the Roses". I photographed this Medieval stained glass window in Leicester’s Guildhall, built by the Guild of Corpus Christi -clearly a white Yorkist rose. 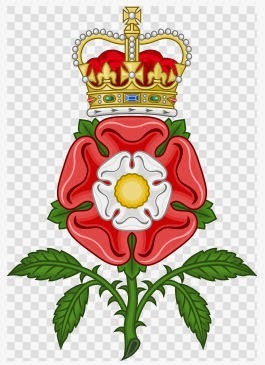 On his marriage, Henry VII adopted the Tudor rose badge joining the white rose of York and the red rose of Lancaster. But according to contemporary accounts, the white rose was much in evidence at Elizabeth'of York's coronation and during the remainder of her lifetime. And what sorts of foods were likely to be served at the Yorkist or Lancastrian Plantagenet royal feasts in medieval times? Well there are good records, including pictorial ones, where we find boar's heads and all types of fowl are probably overepresented for artistic reasons! Even considering the range of dishes that the English nobility ate it cannot nave been easy to convincingly convey a dish of meat stew in a medieval woodcut illustration could it? The first English cookery book "The Forme of Cury" was written at the end of the fourteenth century by the master-cooks in the court of Richard II (1377 - 1399). 'Cury' is the Middle English word for 'cookery'. The book contains 196 recipes, some plain but some unusually spiced and spectacular dishes for banquets. As the culinary compilers tempt us "...curious potages and meetes and sotiltees for alle maner of States bothe hye and lowe." A 12th scale medieval subtlety complete with egg custard filled moat! The word 'sotiltee' or subtlety refers to the elaborate sculptures that often adorned the tables at grand feasts. 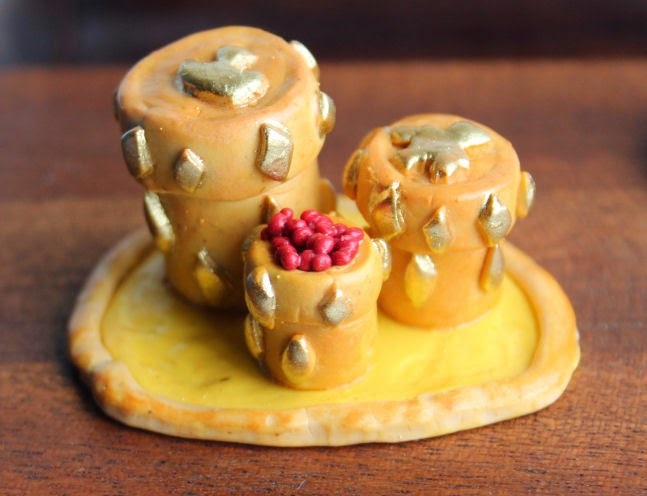 And here is MedievalMorsels version of a subtlety for such a medieval feast or Tudor banquet, crafted historic miniature food at one inch dollhouse food scale! Buckets of eels, eels in pies and eels "reversed"
Portugal's national dish - dried, salted cod!